During a recent visit home, Mom and I took some time to play with her new Pat Green Duncan drum carder. For those fellow fiber geeks who want to know, Mom has the hand-cranked Blender/Carder 8 Inch Hand Crank model. I don’t have anything to compare it to as it’s the only carder I’ve ever used; however, I can report that it was easy for a beginner (me) to use. The only hard part was attaching the drive band. I brought most of a scoured Jacob fleece with me to share with Mom. We spent a couple of happy evenings sorting through the fleece, picking out some to comb, some to tease and card, and some to flick and spin from the lock. We were a bit overly ambitious and, in the end, spent most of our time on the fleece chosen for carding. Teased locks loaded into the tray and ready to be carded. Separating the fiber from the carder. 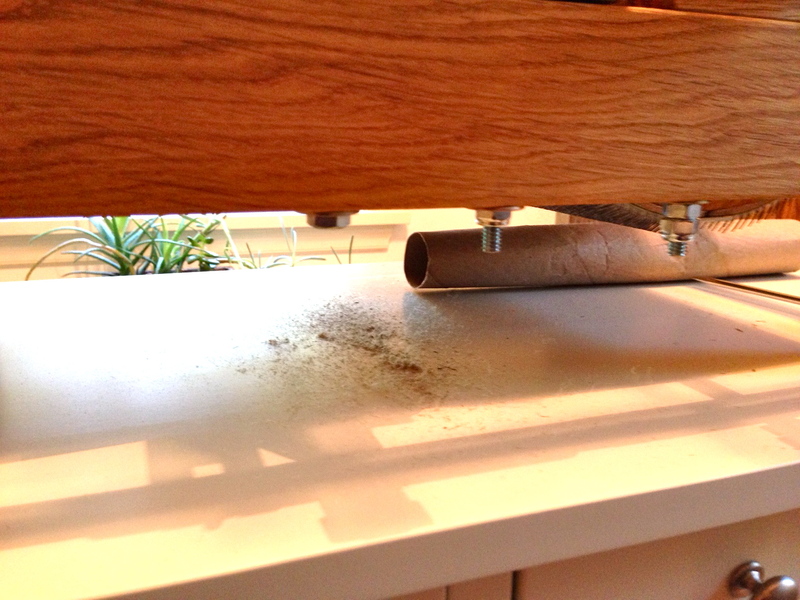 Rolling fiber off the carder using a handy-dandy paper towel tube. After the carder was loaded up and couldn’t take on any more fiber, we used a little metal tool to make a break in the tube of fiber. Then we rolled the fiber off the teeth carefully using a cardboard paper towel roll. After that, the batt of fiber was divided into two or three strips, and the carding process began again. 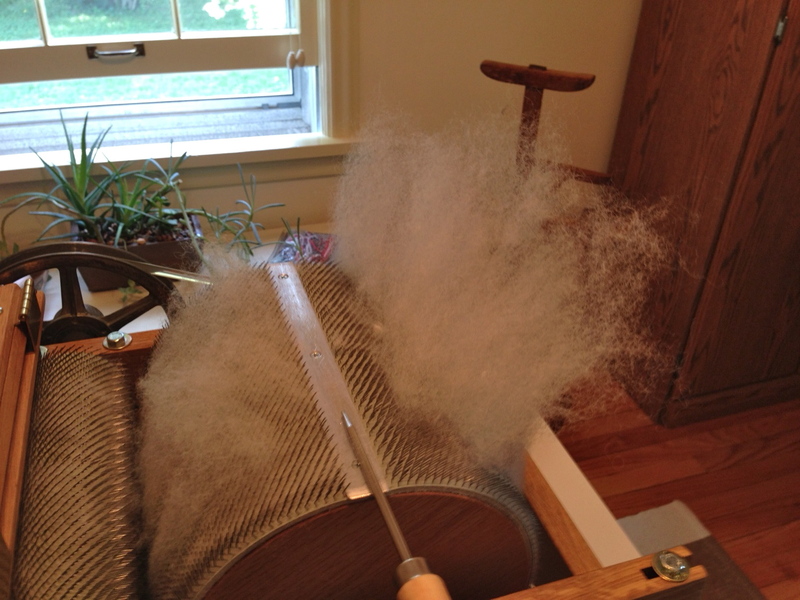 Each batt made three passes through the drum carder before it was (finally) rolled off for the last time. 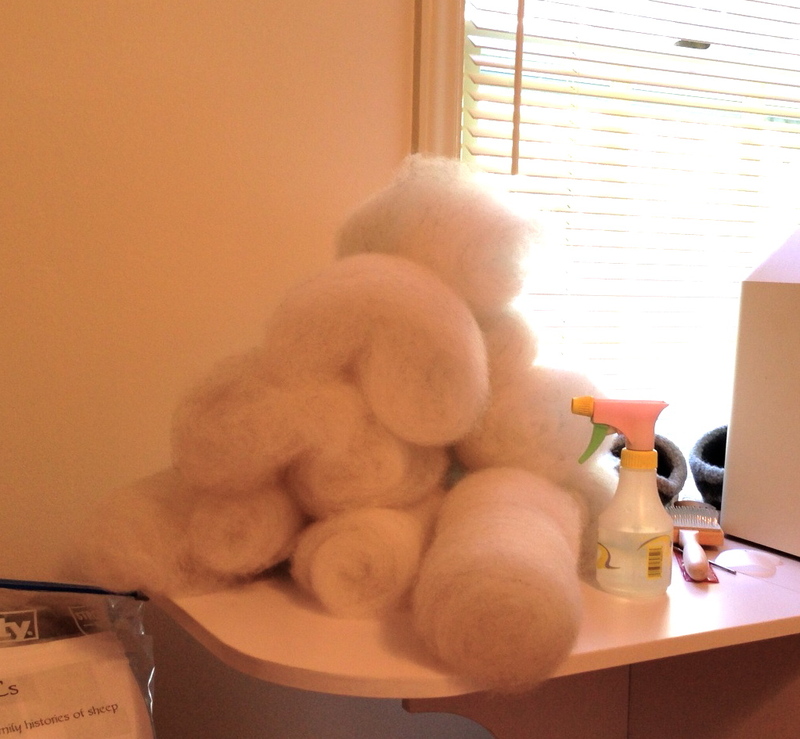 A small but growing mountain of batts. One thing I didn’t realize before diving into this process was how slow it would be. I’m used to using hand carders and I know how slow those are. 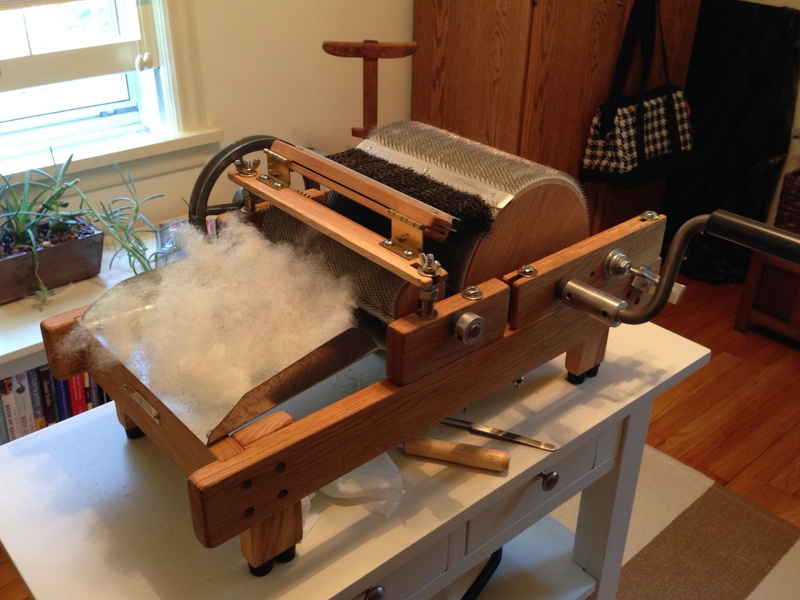 I just assumed that carding on a drum carder would be faster. It probably is. But it sure doesn’t seem like it. You have to crank slowly and evenly so the fiber will take up properly, standing there all the while, shifting from foot to foot, trying not to daydream. It helps to have someone to talk to, or a podcast to listen to. I understand why people who sell fiber for a living spring for the motorized carders. One thing I was very pleased with was the amount of junk the carder removed from the fleece. It was already exceptionally clean, but had a bit of stubborn vegetable matter and dirt caught here and there. The carder took care of it. A slowly growing pile of junk on the table underneath the drum carder. P.S. Ate the spinach fettucine last night. It was really goooood! Thanks for the correction, Mom. I’ve updated the post. I just can’t seem to keep the brand straight. I think you corrected me when I was at home too, but for some reason Pat Green sticks in my head. Doesn’t help that the model mentioned looks so much like your Duncan carder. I’m glad you liked the fettucini. It was a GF variety from RPs. I think they sell them at Woodman’s. At least they used to. So you don’t necessarily have to go to the Farmer’s Market to get them. Very interesting. Thanks for sharing all of the things you are learning. I hope to have a chance to try combing sometime soon. I loved using my mums drum carder when I was little. Very enthusiastic I was! I love that your mum comments on your blog – my mum does too and its awesome. it would be counter intuitive to buy a carder before I really know how to spin. But I have all this alpaca fleece just sitting in bags waiting for some action. I suppose you could felt with the fiber too. How well does alpaca felt? Interesting! 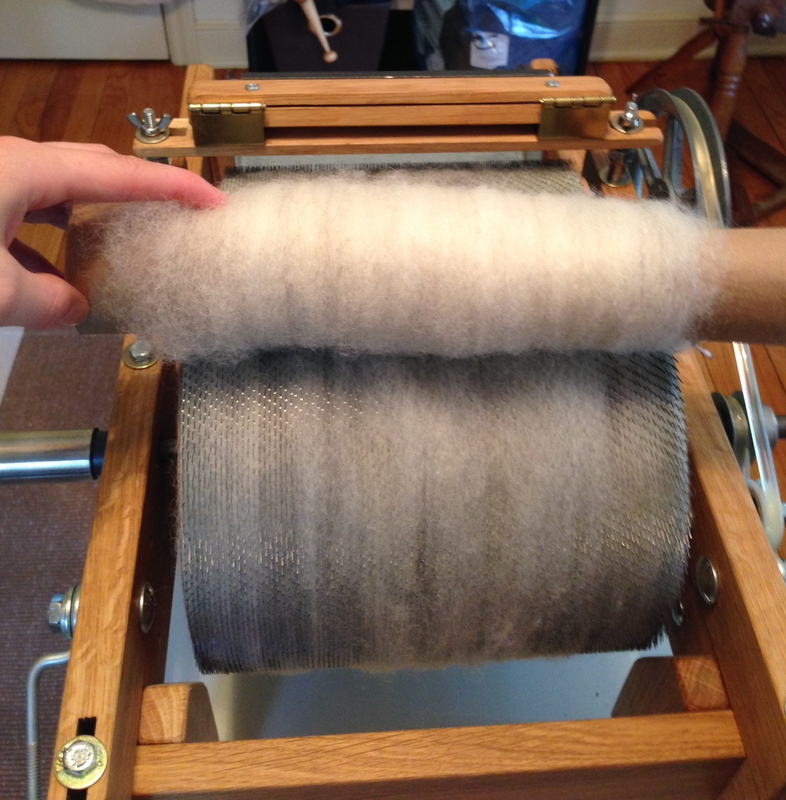 I don’t think I know anyone who has a drum carder; what a fun toy. A very fun toy, if a bit on the sharp side. The MN Weavers Guild has lots of this sort of thing on hand. I’ve always wanted to find a time to go and play. You are so lucky having a mum who is also a fibery person. I feel quite lonely sometimes, being the only person in my family who knits or is remotely interested in things of a woolly nature. Looking forward to seeing what you make of your Jacob! I know. I hope she knows it too. Thanks for this posting. I have never seen carding done and it was neat to be able to learn how the process works. That’s why I wanted to do it. It was at least in part so I could take notes due next time.